Automatic invoices for your Shopify store! 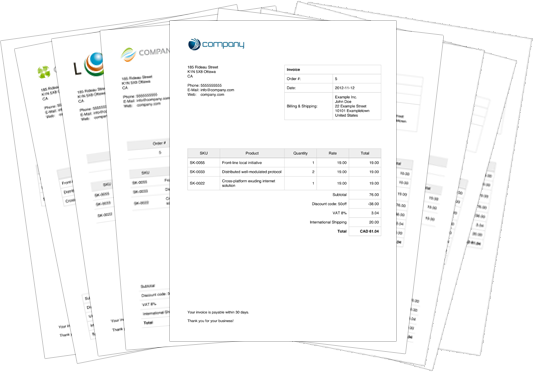 Invoicify creates beautiful PDF invoices and sends them to your customers, fully automated. Select one of our beautiful premade templates or create your own. Every time an order is placed with your store, Invoicify will automatically create a PDF invoice and send it to your customer! Invoicify will automatically generate and email a PDF invoice to each of your customers after they placed their order - fully automated! Select one of our beautiful premade templates for your invoices, or if you fancy yourself a designer, create your own invoice template using CSS, HTML and Liquid, the templating language used to style your Shopify shop. Invoicify can be setup by anybody in a couple of minutes, no programming necessary. Need to change something on your invoices? Everything can be changed using a simple form. Pricing depends on the number of invoices that you plan on sending each month. But no matter which plan you choose, your first 10 days are completely free so you can find out if Invoicify is right for you. Still not sure if Invoicify is for you? Ask away!